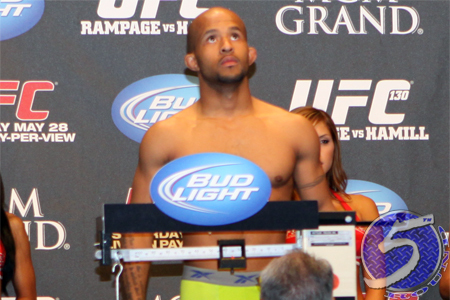 On Tuesday afternoon, it was confirmed Demetrious Johnson (Pictured) and Ian McCall will rematch at “UFC on FX 3.” The event takes place June 8th, although a venue has yet to be locked down. While it was initially announced “Mighty Mouse” had taken a decision victory in the first flyweight fight in Octagon history earlier this month, one of the judges’ scorecards was miscalculated and the contest was changed to a majority draw. The verdict was inaccurately reported that Johnson won via (29-28, 29-28, 29-29) majority decision. Upon even further examination, judge Sal D’Amato awarded McCall with a 10-8 score in the final frame. Therefore, his 29-28 tally in favor of Johnson was changed to a 28-28 draw. The OFFICAL scorecard goes down as, 28-28, 29-29, 29-28 (Johnson). The irony of it all is, the UFC specifically added a sudden death round to the flyweight tournament just in case the bouts resulted in draws. A fourth and decisive stanza should have been executed for Johnson and McCall. The organization did not say if their sequel will be another three-rounder with the potential for a sudden death stanza, or if their 125-pound affair would serve as a five-round main event. The winner of their rematch will meet Joseph Benavidez to determine the company’s first flyweight champion. Benavidez advanced to the tourney finals by knocking out Yasuhiro Urushitani in the 2ndRound of their affair. FX will broadcast the card’s main bouts live at 9PM ET/6PM PT.